No doubt about it, the recently passed tax bill is terrible for working people. But as Lance Taylor states in a blog post titled “Why Stopping Tax ‘Reform’ Won’t Stop Inequality”: “Inequality isn’t driven by taxes—its driven by the power of capital in relation to workers.” Said differently we need to concentrate our efforts on shifting the balance of class power. 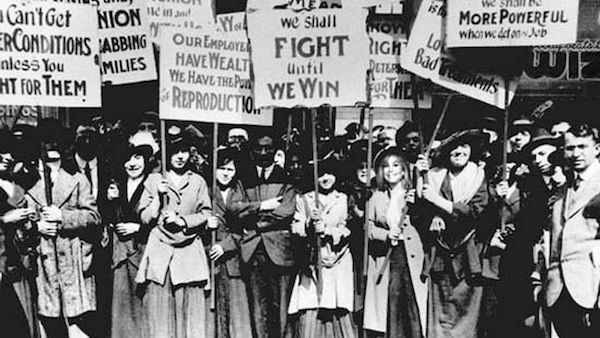 And that means, among other things, putting more of our energy into workplace organizing and revitalizing the trade union movement. The first figure looks at Palma ratios for pre-tax income. The second figure uses disposable or after-tax income. In both figures we see growing ratios, which means that the top 1 percent is increasing its income faster than the other two groups, although the gains are not quite as large in the case of after-tax income, suggesting that taxes and transfers do make a small but real difference. 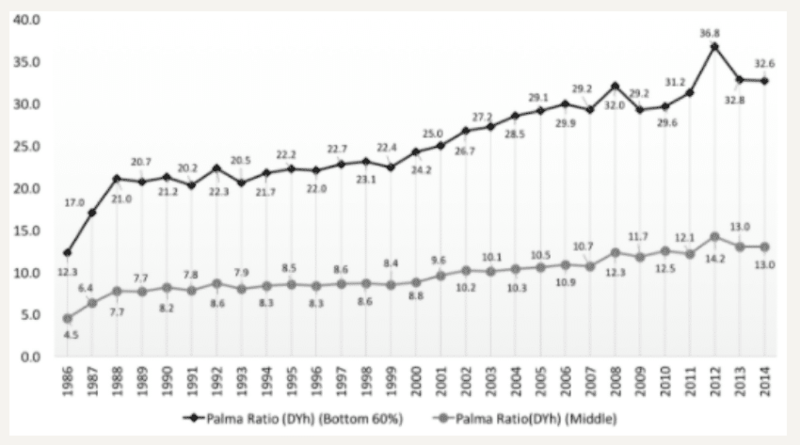 What is also noteworthy is that the Palma growth rates for both the middle and bottom groups are quite close. This is important because it shows that inequality is largely driven by the top earners pulling income from the rest of the population, rather than a widening income gap between Taylor’s middle and bottom groups. As with measures of income inequality, changes in the distribution of earnings indicate that inequality has risen owing largely to a concentration of earnings at the top of the distribution. 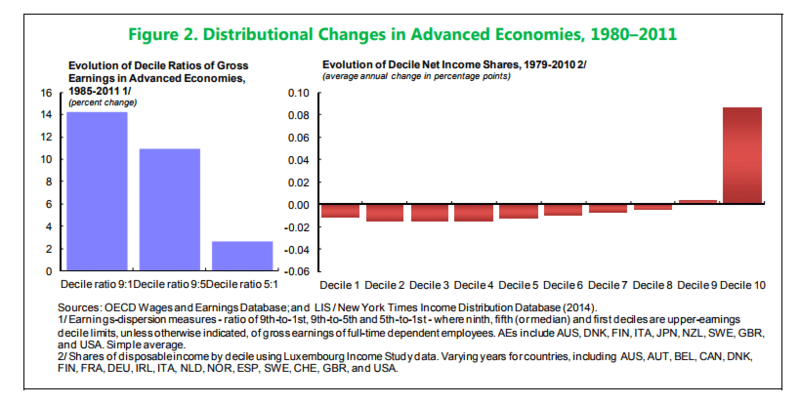 Gross earnings differentials between the 9th and 5th deciles of the distribution have increased over four times as much as the differential between the 5th and 1st deciles. Moreover, data from the Luxembourg Income Survey on net income shares indicate that income shares of the top 10 percent earners have increased at the expense of all other income groups. While there is some country heterogeneity, the increase in top income shares since the 1980s appears to be a pervasive phenomenon. 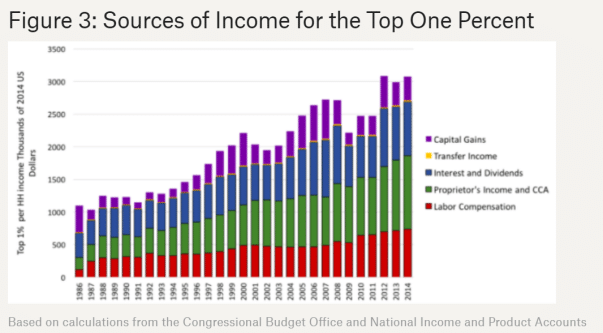 As we can see in the first figure above, rich households, with a mean income of greater than $2 million a year, have “40 times the income of the bottom 60 percent and 13.5 times payments going to the middle class.” In the figure below, Taylor illustrates the source of that income. One way or another, he finds that it comes from capital ownership and profits. As we can see, labor compensation has grown rapidly over the last few years, and now exceeds $500,000 per year. Still, it represents only roughly nine percent of the total, significantly less than either of the other two main income categories, proprietor’s income and interest and dividends. Proprietor’s income, interest and dividends, and capital gains all flow from ownership. So, in fact, does an important share of labor compensation which includes bonuses and stock options. 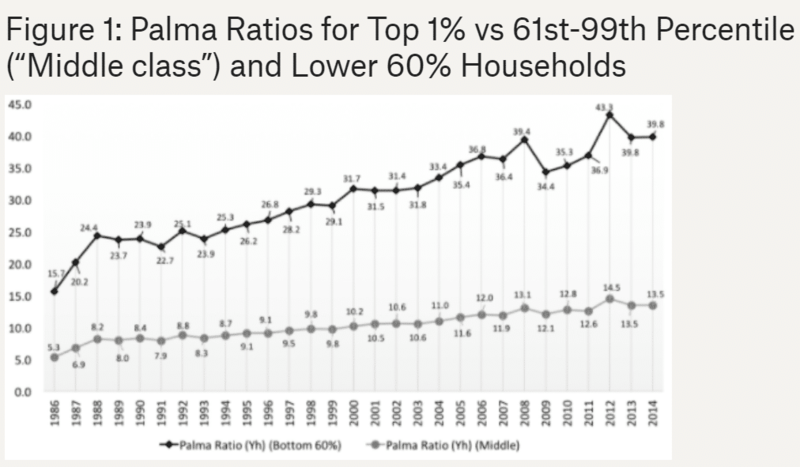 Given that the bulk of income of the top one percent comes from profits through one channel or another, the obvious inference is that the rising Palma ratios in Figure 1 were fueled by an ongoing shift away from wages in the “functional” income distribution between labor and capital. The question is why wages of ordinary households lagged. Divide-and-rule in a “fissuring” labor market, as described by David Weil (2014) is one aspect of this process. Globalization, which came to the forefront in the 2016 Presidential election, also played a role. Our benchmark estimates of gross income inequality indicate that the weakening of unions is related to increases in the top 10 percent income share. A 10 percentage point decline in union density is associated with a 5 percent increase in the top 10 percent income share. The relation between union density and the Gini of gross income is also negative and significant. On average, the decline in union density explains about 40 percent of the 5 percentage point increase in the top 10 percent income share . . . . By contrast, the decline in unionization contributes more modestly to the rise of the gross income Gini, reflecting the somewhat weaker relation between these variables. However, about half of the increase in the Gini of net income is explained by the decline in union density, evidencing the additional and statistically significant relation between this institution and redistribution. The decline in union density was a widespread phenomenon which, as our estimation results suggest, could be an important contributing factor to the rise in top income shares. it took 30 or 40 years for the present distributional mess to emerge. It may well take a similar span of time to clean it up. Progressive tax changes of $100 billion here or $50 billion there are not going to impact overall inequality. The same is true of once-off interventions such as raising the minimum wage by a few dollars per hour. Long-term improvement requires changes to the present situation that can cumulate over time. And that requires rebuilding labor’s strength so as to secure meaningful wage increases and a transformation in economic institutions and dynamics. As the IMF study makes clear, fighting for strong unions must be an important part of the process.